Without doubt, the most destructive, recent 'false flag' operation has been the 'sleeper cell' one that the Mossad put together to entrap neo-Nazis wanting memorabilia of Hitler's regime - particularly pieces of the entrance sign to the Auschwitz concenteration camp - to help fianance attacks on governments which were not doing enough for Israel. (1) It turned into an uttter fiasco when middleman in any transfer, Anders Högström, turned whistleblower - what ultimately induced the terrible blowback by Anders Brevik in Norway. He turned deadly on the authorities who had aided and abetted its efforts without real results up until then, killing 77 of the up-and-coming supporters of Norway's government by bombing Oslo's government center, and then shooting Labor youths being indoctrinated to take over on a nearby island. The attacks were more deadly and destructive of Israeli interests than the so-called Lavon affair where agents of the Israeli Defence Force, posing as agents of Egypt's Nasser regime, carried out attacks on American and British facilities in 1954, only to be caught red-handed in the process. The blowback then only resulted in the execution and imprisonment of the culprits, and undermined the reputation of many of Israel's leaders while the blowback from Breivik's massacre destroyed much of the support that the Jewish state had in Scandinavia. Meir Dagan's Mossad was most upset by the surprise fiasco as it expected the heist of the Auschwitz rntrance sign to be the crowning achievement of his tenure as director - what would restore flaging support for Israeli interests because of what Hitler's regime had done to the Jews during The Holocaust. The sign would be transported and cut up in Sweden for sale to collectors of such memorabilia for money which neo-Nazis would allegedly use to finance terrorist attacks upon Swedish government buildings and leading politicians because of weak support of Israeli interests, especially their supplying support for Muslims displaced by the continuing conflicts in the Middle East. This way Tel Aviv would achieve the best kind of result - rekindling support for its claims about anti-semitism while hurting those who cared for those hurt by its conflicts while at the least risk of any serious blowback. The mission had been hastily called after the expected death of rabid anti-semite James von Brunn who had shot up the American Holocaust Museum in Washington the previous July, and whose trial because of the murder of a security guard was sure to garner new support for Israel. Högstrom was most interested in setting up infamous neo-Nazi millionaire, Lars Göran.Whalström, in Sweden as the cruel collector of such memorabilia. Högstöm had started the violent Nationalist Front in the early 1990s, apparently with Whalströms help, but he turned against it in 1999 after it assassinated trade unionist Björn Söderberg. He also started the group Exit to assist like-minded neo-Nazis leaving the movement. The heist was a 'false flag' operation to make up for the unexpected death of von Brunn. The Mossad was planning on selling it to targets whose exposure - like Marc Garlasco of Human Rights Watch, and later a UN most Senior Human Rights officer -would be more productive. Garlasco really isn't an anti-semite, and denier of The Holocaust, only an official who did not suit Israel's interests while dealing with the Palestinians. When Högström discovered that the stolen sign was not on its way to Sweden, but stored nearby Auschwitz to be shipped on a Corendon airliner to Israel where it would later be transported elsewhere for sale, he turned informer. Breivik was most interested in arranging a sale with an English millionaire in Stockholm of the same sort for the Mossad mission because he was starting to run out of funds because of his comings and goings. He apparently had financed his operations by selling gifts he had been given to avoid the authorities wondering where his funds were coming from. Högström's informing made any operation difficult to put together, forcing him to rely more and more on just his own efforts. There were also problems of sending Högstrom to Poland for his involvement in the crime because he could stymie an extradition request by justifying what he had done - what would certainly reveal Corendon's involvement in the shipment, and that would implicate Captain Thomas Salme in the process. Salme had gotten into flying while working as a mechanical engineer for SAS airlines at Arlanda Airport. He could have become a role model for the 9/11 highjackers as he just decided to move into the cockpit by forging the necessary credentials while practicing on a flight simulator for Boeing 737s. The Swedish Transport Authority, to make up for its lack of oversight regarding Salme's being a pilot, and to take advantage of what Högstrom knew, got rid of the problem by tipping off ones in Holland about his lack of qualifications, and he was conveniently arrested just before takeoff in a Coredon flight from Amsterdam's Schiphol Airport on March 3, 2010. For all the trouble and embarrassment Salme had caused, one would hardly know it by the way he was treated. A Ducth court fined him $2,500 for flying without a license all those years, and prohibted him from flying for a year. Then he was treated as a celebrity, appearing, for example, on the Kevin Trudeau Show, as if he were just another crazy highjacker who found fame for it. Jouranlist and publicist Stefan Lovgren is helping Salme write his autobiography, 13 Years in Heaven, and found a publisher for it. It will apparently appear in 2012 - thanks to Norstedt's, one of Sweden's oldest, and most respected publishers, taking it on. Certainly showed, as the old adage goes, crime pays. Breivik certainly didn't miss the disparity in treatment between Högström and Salme, deciding that he would proceed alone, as best he could, in his efforts - a crusade which not only settled scores with his betrayers but also with the authorities who had not taken them too seriously. In late August and early September, Breivik was in Prague to purchase arms for some kind of shootout. He even hollowed out the areas underneath the seats of his Hyundai Atos so that they could be filled with an AK-47, a Glock pistol, and rocket and hand grenades. Brevik even took up a prospectus about mining so that it could justify his seeking explosives for even greater carnage. He came back to Norway empty-handed, though, discovering that it was easier to obtain such items in Oslo than in the Czech Republic. Meanwhile, Högström had the book thrown at him by the Polish authorities. Once he had been extradicted there, it was just a matter of time before he was sent to the cooler. Marcin Auguscinski, who had been recruited by Högström to do convenient neo-Nazi missions while he worked on his family's estate in southern Sweden, filled in all the details about the theft that he and other Poles had carried at Högström's direction, leaving no other one higher to be exposed in the Mossad operation. By December, Högström was headed for 32 months in prison for serving as its middleman - what he managed to be served in Sweden by year's end because of his cooperation in the investigation. Breivik by then had decided to use a suicide bomber to do the trick, relying upon what the English Defence League (EDL) had been able to gather to finance such operations, and an operative to do it. The EDL had long had a jihadist, Glasgow nursing student Ezedden Al-Khadeli collecting money in bank accouts that he had esblished at TSB, the Post Office, The Halifax, and The Bank of Scotland, often with the use of stolen identities. He had become at jihadist while attending the University of Luton, along with Swedish resident Taimour Abdulwahab aka Al-Abdaly. He was persuaded to become a suicide bomber, thanks to almost all the money that Al-Khadeli had collected. The target would be Stokholm streets - not its government buildings and officials as originally planned, it seems, by Whälstrom's neo-Nazis - filled with Christmas shoppers. The plan was an ingenious one where an unsuspected jihadist obtained the necessary equipment - fertilizer, pressure cookers, batteries, and mobile phones to trigger the explosions - and set them off in a country whose capital was considered one of the safest places on the planet. While the Czechs had put Breivik on the watch list for wanting similar items, the Norwegians didn't, considering him not to be dangerous. Anders helped in the disguise by buying on the internet 300 grams of sodium nitrite - a good chemical to triggeer an explosion - from a Polish supplier, Wroclaw, just at this time, showing that he was apparently using the fertizer he had bought to further his mining plans back home. On December 11th, it was easy for Al-Abdaly to drive into central Stockholm from a suburb, park his car on Drottingatan, and set it afire - what caused people to take shelter when it feebly exploded. Then he went into another street, and his bomb belt started exploding, most likely accidentally, killing himself and injuring two passersby. He, it seems, didn't know how to wire a string of bombs in series with cables. The most suspicious aspect of the suicide bombing was that an onlooker suddenly appeared on the site, and took zoom-photos of the dying bomber - what two people witnessed, and a 24/7 surveillance camera had taken pictures of belonging to a shopowner who had installed across the street for his own security. The police, and the security agency, Säpo, were surprisingly not interested in viewing it - what could at least identify who he was. Thr bombing certainly did not have the desired effect of Islamophobes, though it did quite frighten the public. Sweden did not tighten up its security laws. The eavesdropping agency, FRA, was not given greater powers to find such suspected terrorists - what was used by some to explain the litttle success that the suicide bomber had had. More important, the Swedish government did not tighten up its admission of immigrants, especially Muslims from the Middle East, from seeking sanctuary in Sweden. The most telling sign of the mission's failure was the e-mail which was sent to Säpo and the Swedish news service (TT), demanding that Sweden withdraw its 500 troops from the NATO mission in Afghanistan, and justifying such violence because of Swedish cartoonist Lars Vilks protraying Mohommad as a dog (4) - what the government has gone out of its ways to show that it has no intention of changing these policies. The failure of Säpo and the police to take advantage of the video that the shopowneer offered looks more suspicious, though. The government, in November, had appointed a special prosecutor to look into the American Embassy in Stockholm, spying unlawfully on Swedish citizens. It was going along with what the Norwegians were doing when similar charges were made about the Embassy in Oslo. (5) In neither, it seems, had American security informed the respective government authorities of what they were doing - what could only be justified in Stockholm if the Americans had placed signs below their dozen monitoring cameras, explaining that they were taping the scene. It would prove most contradictory if the Swedish authorities then used the illegal videos that the shopkeeper had made to get to the bottom of the plot, so they just forgot about the whole matter, especially since only the suicide bomber had been killed in the bombings. 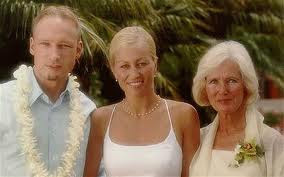 The person most upset by all this was the photographer who had taken the close-ups, apparently Anders Breivik. Instead of having a scene of carnage whose photographs would put all people in Scandinavia on notice about the capabilities of Muslim jihadists, he was left with little more than close-ups of the incompetent deceased - what were of no use to him or anyone else. Despite all the claims about Breivik's verbal abilities, he was most involved in photography and creating art to represent his reality. This he now used in finishing his famous 2083 - A Europesan Declaration of Independence, and his day-by-day entries in his diary. It was filled with all kinds of pictures, photos, digitally-enhanced images, cartoons, and made-up propaganda in case viewers could not glean the meaning of his verbal attacks upon cultural marxism, multiculturalism, islam, muslim immigration, feminisim, and the like. It is a illustration of what can be done with photo psychology and reading pictures. Anders' fixation on his looks was well illustrated when he went to America for a face job after some Muslim friends had broken his nose, scared his forehead and chin in a fight which helped make him an islamophobe. His incredible narcissism was portrayed in the self portraits he took of himself as a Freemason, a Norwegian military hero, and a covert operator or photographer - what he is most worried about authorities suppressing now with less glamoress ones. The killer is obsessed with appearances - what was the root cause of his undoing. Breivik was also setting up shop and testing explosions in Norway so that he would prove far more effective in arousing the West about the threat than Al-Abdaly had. In May 2011, he finally gave some semblance of life to his alleged farming interests by buying six tons of fertilizer for bomb making at his Geofarm at Åsta, 83 miles northeast of Oslo, and then moving there to test a bomb - what he accomplished on June 13th. He claimed that the project cost him around 300,000 euros. It took him - the knight Justiciar grandmaster of the new Templars who he had even portrayed himself in the closing pages of his manifesto when the Muslims had allegedly been chased back by 2083 to where they had come from - another six weeks to get his targets straight, and screw up the courage to get it started. He had to find some competent Muslim he could trust to do a bombing in Oslo, something he thought was impossible and never materialized. Or else, he had to find some like-minded Norwegian who waa willing to become a suicide bomber to achieve his goals. But in making up for Högstrom's betrayals, and Al-Abdaly's imcompetence, he overlooked the facts that he was not a Muslim, and Högstrom was never on his side, so doing dirty work allegedly with them was bound to become increasingly confusing. One can only suspect that his original supporters - especially Director Meir Dagen of the Mossad, now not wanting to retire on such a risky note - had decided that Breivik had outlived his usefulness, and had dropped him, explaining why he decided to turn the tables on it by attacking those in Scandinavia who opposed its efforts, not realizing how stupid it would seem, and counterproductive it would be. As a Norwegian, he should have settled for a car bomb at one of its mosques, and taken his chances by fleeing the country .By bombing public offices in Oslo, resulting in eight deaths, and killing another 69 at the Labour Party's Worker Youth League summer camp at Utoya only made some kind of sense until the authorities found out that he was just like them, another native Norwegian. He had just lost the thread of the whole plot while atttempting to carry it out. What had triggered the chaos was the announcement by Eskil Pedersen, the head of the Labor Party's Youth Movement, that it was calling upon the government to impose an "unlimited economic embargo of Israel from the Norwegian side" because of its continuing mistreatment of the Palestinians, as the tabloid Dagbladet reported two days before the shooting. The announcement sent him into a complete tailspin which he resolved by setting off the van, filled with explosives outside the goverment complex, only to rush off to the island to kill those who were willing to support the embargo until his cellphone pleas to the security authorities as one of its Commanders to stop it was achieved when its Delta force arrrived on the scene, and he had run out of ammunition. In short, because of the confused, convoluted history Breivik had had in trying to punish the jihadists at old neo-Nazi expense, he had become the paranoid schizophrenic that his apologists belatedly acknowledged. 1. For more, see my article about the Auschwitz sign heist. 2. Jesus Diaz, "The Guy Who Flew Thousands Of Passengers As A Fake Pilot," May 18, 2010. 7. Quoted from ibid. in english. The fog has never really cleared since an RAF Chinook helicopter crashed through it on the Hill of Stone at the Mull of Kintyre on June 2, 1994, killing all 25 intelligence agents and the crew of four on board while on its way to Fort George in Scotland to attend an annual conference on counterterrorism. While the incident is of more recent vintage than Bloody Sunday when British soldiers, epecially of the Parachute Regiment, cut down forteen civilians after shots were fired by unknown parties, the helicopter crash caused 29 victims. 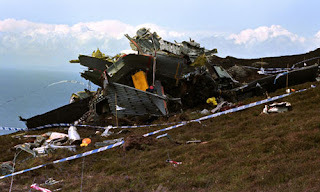 In addition, the Army massacre occurred in an area where plans had long been made for meeting some such incident, the crash came as a complete surprise. Ultimately, both incidents were the subject of several inquiries which resulted in quite changing explanations of the tragedies. The only sure thing is that Bloody Sunday helped usher in direct rule from London while the helicopter crash helped usher it out. In explaining the policy, Ford and lower commanders made it increasingly possible that protesters might be aimed at, and shot in any confrontation over its implementation. This occurred when protesters marched on January 22, 1972 to Magilligan Point to show their opposition to internment Then after the Provisionals shot dead two Royal Irish Constabulary (RUC) police officers, the first in the growing conflict, the Brish Army tried to prevent a similar march from reaching Derry's Guildhall Square a week later by employing the First Parachute Regiment to help "scoop up" the troublemakers. All hell broke loose on January 30th when a crowd of 10,000 protesters started marching on the City Centre, and a group of troublemakers broke off from the main group as it neared it to confront the barricading soliders. At the same time, straggers started engaging the Paras who had taken up position on the high wall behind the William Street Presbyterian Church. Then shots were exchanged, six in all, one apparently by the Offical IRA, and the other by the British Army, hitting two persons who they falsely claimed to be nail-bombers, and only one of whom was involved in the IRA in the march. Then the military forces behind the barricades, assisted by the Paras, executed a pincer movement against the rioters who were confronting them. In the ensuing mele, a youth was killed in the courtyard of the Rossville Flats. "The other tweleve victims of 'Bloody Sunday' died elsewhere." (2) Again, it was a question of who had fired first, if at all on the marchers' side, and how many rounds. The tragedy was investigated by Lord Widgery, the Lord Chief Justice of England, and he rushed to judgment in no uncertain terms on the side of the forces, merely compounding what was seen by almost all as a outright victory for the Provisionals, as direct rule on London soon followed. The only trouble was that the IRA, instead of sitting on their laurels and waiting for the British chickens to come home to roost, went on the offensive, culminating in their own Bloody Friday which turned the tables back in Britain's favor. The Offical IRA set off a bomb on February 22nd at the Paras' headquarters in Aldershot, killing five cleaning ladies, an Army chaplain, and a gardener. (3) Then there was a bombing in Derry, and a killing of a young Royal Irish Ranger which caused such blowback against the Officials that they were obliged to call a ceasefire. While the Provisionals were soon obliged to follow suit because of similar mistakes, the whole situation changed for them when they caused Bloody Friday on July 21st - setting of twenty car bombs in Befast, killing nine people and injuring 130. Margaret Thatcher proved to be her own political gravedigger in making Murray wrong, and she herself right. It all started when the Prime Minister went beserk when Captain Simon Hayward' biography, Under Fire: My Own Story, appeared. Hayward, apparently Olof Palme's assassin who had subsequently been set-up on a drug-smuggling charge in Sweden to conveniently get him out of the way for the still unsolved crime, had written most bitterly about how the Foreign Office and Ministry of Defence personnel had dealt with his problems there, and now Foreign Secretary Sir Geoffrey Howe had allowed it all to be made public - what could only arouse questions about what else was going on. (6) Seemingly out of the blue, the Prime Minister sacked the Foreign Secretary and the Secretary of Defence George Younger had resigned in protest over Howe's treatment. While this profound shake-up was never explained, only crudely covered up by her underlings, and in her autobiography, it had long-term consequences upon her tenure as Prime Minister. Howe, demoted to Leader of the House of Commons, a completely useless post, was most bitter about his treatment, waiting for a chance to get even. The loss of Younger was even more important since he had handled Thatcher's re-election the last time she was up for party leader. Without Younger, there was no one willing to mobilize support for her, and in a growing political vacuum, she isolated herself even more as her closest adviser on Northern Ireland, Ian Gow, was assassinated in July 1990 in a way which most recalled Airey Neave's murder. (7) It seemed hardly deserved after the British had allowed the IRA's last flying column attack on its Derryard outpost to escape without loss after it had killed two soldiers of the King's Own Scottish Bordereres. The attack was the long-delayed 'tet' offensive, designed to spark an uprising in the North to join the Republic - what had long been delayed by the capture of the Eksund, loaded wíth Libyan weapons for the Provos. Since the SAS culls of their volunteers, culiminating with the one on The Rock, the Brits had had to play it cool because they overdid it, losing their prime source in the PIRA Council, aka "Steak Knife", in the process. He helped organize the booby trap which killed six British soldiers in Lisburn in June 1988, and the Semtex improvised explovie device which killed another eight along the Ballygawley-Omagh Road two months later. Peter Brooke had taken over as the Northern Ireland Secretary of State by then, and stunned the public on November 1st that if the IRA stopped their violent activities, the Government might well be obliged to negotiate a settlement with it. (8) This was taken by the Provos as a sign of weakness by the British, so they carried out an attack on the mainland, killing 11 Royal Marine bandsmen at Deal, Kent in following September. The fallout from the fiasco was so damning that the Provos were obliged most reluctantly to declare a three-day-ceasefire over Christmas - what the media chose to see as a response of Brooke's offer. (11) This revived peace talks which had been dormant for a decade. Only this time, it was "Steak Knife" himself who was dealing with the leading MI5 official John Deverell in Derry rather than MI6's Michael Oatley under now the excuse that the PM was still not interested in talking to the Provos because it would be seen as an obvious U-turn by the *Iron Lady'. challenging her style of leaderhp in his famous resignation speech in the Commons on November 13th. This was seen as opening the door for Michael Haseltine, her arch enemy, replacing her - what seemed to be happening when his challenge for the party leadership resulted in a second ballot on the issue. She chose to see it as failing a vote of confiden, and resigned, to everyone's surprise, as PM. She even tried to stay on without its support, but her colleagues would not hear of such an unprecedented effort. Perhaps, it was just a ruse to show how committed she was against any dealings with the Provisionals. With the 'Iron Lady' out of the way, steps to arrange a settlement gathered pace. The most imporant one was to hand over the computers systems to the RUC's Special Branch so that it could stop violent incidents while bringing their perpetrators to account rather than just allowing the covert operators do another ambush or cull. The leader of the new approach was Detective Chief Inspector Ian Phoenix. The ensuing struggle between peacemakers and warmakers in Northern Ireland has been more complicated then than anyone imagined, especially from the British side. While the Provos were slowly brought along, thanks to the convenient imprisonment of '"Steak knife" apparently aka Padraig Wilson so that he would not be assaasinated by his more aggressive colleagues, and could bring imprisoned ones along with the peace process, the British were confronted by keeping it officially going by having still a government in Westminster which would endorse it, stopping the infigfhting by warmakers on the mainland and in the province from continuing their disputes, getting counter insurgency elements in Northern Ireland and on the mainland to go along with a single agenda, and forgetting about complaints all concerned had about changing what they had long been involved in. In all this, despite appearances, Phoenix's RUC Special Branch group, involved in reducing political terrorism to just another form of domestic crime, was most central to the process. The biggest trouble was not only were joy-riders made out to be terrorists, but also Karen Reilly was no Provo volunteer but the adopted daughter, it seems, of RUC policeman, and colleague of Phoenix's, John Reilly whose wife Diane who had been married to James McGrillen when she had Karen. (14) McGrillen, an IRA volunteer, had been shot dead similarly in 1976 for car theft. While the killing of Peake and Karen Reilly had just been a result of the Paras going after alleged Provo terrorists, the Reillys saw it as the result of Pheonix's Special Branch going slow on stopping real terrorism, goading the ´Paras to do more. Despite the fact that Ian and Susan Phoenix tried to band with the Reillys over the tragedy, making out that it was simply an accident, and even Ian attending her funeral despite orders against it (15), the Reíllys would not have any of it. Phoenix, it seems, had made a mortal enemy which norhing could undo. On an institutional level, matters were just as bad in the province and on the mainland because MI5 aka the BOX thought that the RUC was not doing enough to stop Provo terrorism when it was actually doing more despite appearances. MI5 officials were completely turned off when they discovered while on a vist to the province, Phoenix and his agents having a champagne briefing in the morning during which 18 bottles were consummed for an SAS colleague who was leaving (16). Still, the unit, soon upgraded, was providing 80% of the intelligence which was stopping terrorist attacks. The biggest bone of contention between the BOX and Phoenix's unit was over who was directing the ASUs in Britain which were causing most of the havoc.MI5 believed that it was Sean McNulty in North Shields, and Phoenix's SB unit thought it was Phelim Hamill of Queen's Univeristy. The biggest asset Phoenix had in stopping IRA killing was Martin McGartland aka 'Carol'. (17) McGartland began informing on the activities of 'H' whose ASU specialized in booby-trapping cars. Thanks to his leads, Ian's people prevented a Ulster Defence Regiment soldier from being blown up in North Down, prevented the blowing up of a policeman and a shopping center on November 1, 1990, and then it almost caught 'H' red handed with his bomb making factory.In all, McGartland was credited with having saved 50 people from death at the hands of the Provos.Ultimately, 'Carol' was captured by the Provos' Civil Administration Team aka the torturers, and only escaped death by jumping out of a windon when they were panicked by a helicopter passing overhead. With his cover blown, McGartland was forced to flee to Britain where he was given a new life as Martin Ashe in Whitley Bay, and £100,000, apparently by MI5. £2,000 for a handler to recruit a new Provo source. (20) Then Ian asked an alleged trusted colleague, apparently Reilly, if he could borrow his best Barbour jacket for the trip as he planned to do some hiking between conference meetings. Ian then met him over coffee, and "they briefly discussed the PIRA peace moves and how they might be pushed forward. "(21) Then he went home at 2 PM to have lunch, and pack for the 5:45 PM from RAF Aldergrove, only to have the Reilly call again. "Have a good weekend. See you Monday." (22) It seemed a bit contrived, like someone wanting an alibi while being involved in some unknown covert action. "In an interview hours before the crash, the Head of Special Branch (Bob Fitzsimmons) had told Sunday Times journalist Liam Clarke that Adams was trying to end the violence: 'However, he questioned Adams's ability to do so, and believed that a final decision to stop the killing would not be taken until security forces had weakened the terrorist structure.' " (23) Seems that Fitzsimmons' confidence was based upon the security establishment in Northern Ireland having resumed contact with McGartland, and he was on the ground at the Mull of Kintyre to be picked up so that he could be taken to the conference. He would tell it that the Provos were on the ropes, thanks to what he and Phoenix's people had done - what would be a great embarrassment and set-back to the BOX. The person they planned to pick up, apparently Martin McGartland, witnessed the crash and was horrified by it. Instead of the conference being obliged to work on closely with the RUC, especially its SB, it just acknowledged that MI5 ran everything now because there was really no one else. The source who McGartland wanted to develop, whoever it was, didn't need to be told that the Provos best hopes in a settlement had been greatly reduced by the crash. Little wonder that three months later, after everyone had been consulted on the mainland and back in Ulster, those in prison and those not, the Provos announced their long-awaited ceasefire. Under the circumstances, Prime Minister John Major, who had taken over for Howe when Maggie sacked himl, was quite subdued about the situation, doubting that it would hold up, but it did. Conditions got worse for MCGartland when a board of inquiry reported without pointing the finger at the pilots, only to have two senior RAF officers add just that. The inquest could not come up with any answer either for the crash. When the sabotaging of the Chinook seemed well and truly buried, MI5's Director General at the time was allowed the unprecedented liberty of publishing her intelligence memoirs, Open Secret, and, of course, she nothing of substance about it, only that she was most upset about the deaths of the RUC officers, especially that of Bob Firzsimmons, the head of its SB. The names of her own staff lost, particularly that of DCI John Deverell, was never mentioned. The best evidence of McGartland being the man to be picked up is how the Provos have gone after him, once he became known to the public in the Northeast when the NOrthumbria police caught him speeding, and discovered who he really is. Provos almost killed him for it in 1999, shooting him six times. By this time, he had written about 'Carol's exploits against them, Fifty Dead Men Walking, which was recently made into a successful film, though McGartland didn't like it. Only time will tell if those who sabotaged the Chinook are finally brought to justice. 1. Peter Taylor, Brits: The War Against the IRA, p. 85. 3. Ed Moloney, A Secret History of the IRA, p. 111. 7. Paul Routledge, Public Servant, Secret Agent, p. 350ff. 8. Taylor, op. cit., pp. 313-4. 9. Moloney, op. cit, p. 334. 10. Tony Geraghty; The Irish War, pp. 158-9. It is interesting to note that after the book appeared in 1998, and the eaverdropping role in achieving a settlement became better known, Geraghty was prosecuted, and almost sent to prison for discussing these systems which were so important in bringing the Provos to heel. 11. See, e. g., Taylor, p. 315. 12. Jack Holland and Susan Phoenix, Phoenix: Policing The Shadows, pp.249-51. 13. Geraghty, op. cit., p. 104. 15. Holland and Phoenix, op. cit., pp. 276-7. 17. For more, see ibid., p. 262ff. 24. Holland and Phoenix - op. cit., p. 333.